Plenty of apps are born over a cup of joe or a glass of wine or beer. Here’s an idea brewed over a beer by a couple of geologists who were fiddling with Untappd, an app covering the who, what and where of microbrews. 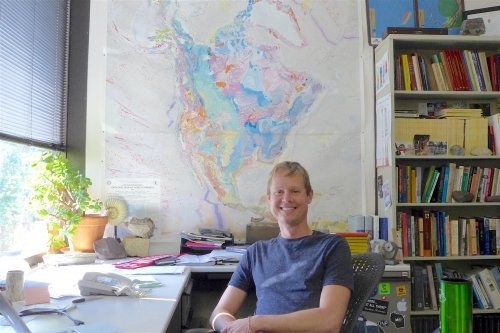 As Shanan Peters, a professor of geoscience at the University of Wisconsin-Madison, and Patrick McLaughlin, formerly at the Wisconsin Geological and Natural History Survey, mulled it over, the kernel of a great idea emerged: Why not do the same thing for geology and open a two-way channel between experts and amateurs? With its GPS-driven accuracy, Rockd overcomes a key limitation on geologic maps: their focus on big structures. “Using a map, it can be hard to tell specifically where to go to see a particular rock unit exposed at the surface,” Peters says. 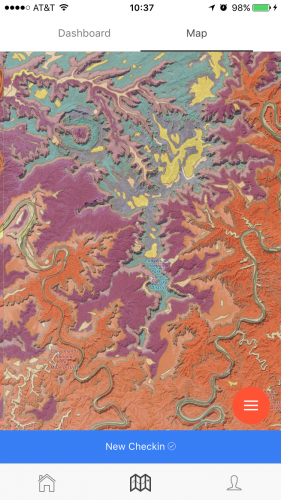 A river-dissected plateau near Moab, Utah, shown in Rockd. Colors show the age of rocks; two winding rivers cut deeply into the strata. 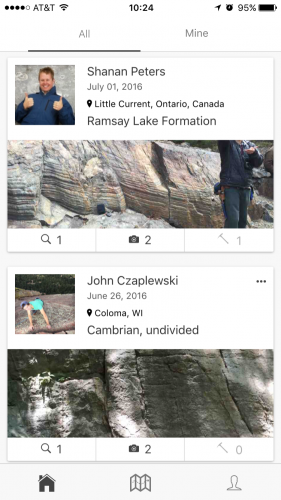 This project was supported by grants from the National Science Foundation (EAR-1150082), the UW-Madison Department of Geoscience, and other sources.